It’s always hard when you have to come up with a gender neutral prize for a party, but I think this is a great idea that anyone would love. I just love these for gifts too. It’s brownie mixture in a jar, all the recipient has to do is add the wet ingredients and bake. Then they have a tasty treat to enjoy!! This is the one I made for the game at our Oh Boy celebration. They are super simple. You can make them from scratch or use a good quality packet mix as the starting base (which is what I did). These are triple chocolate fudge brownies. 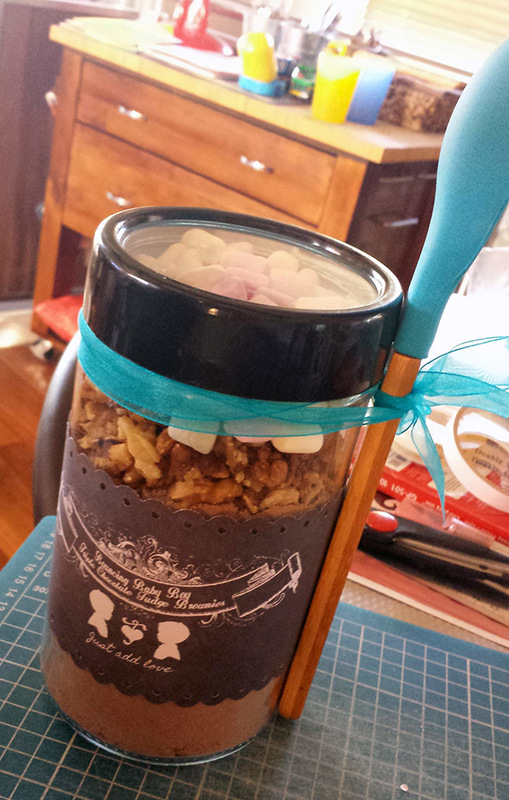 I’ve added walnuts and mini marshmallows to the jar too. Decorated with a custom label (including the instructions to bake them) and a matching spoon tied on with ribbon.